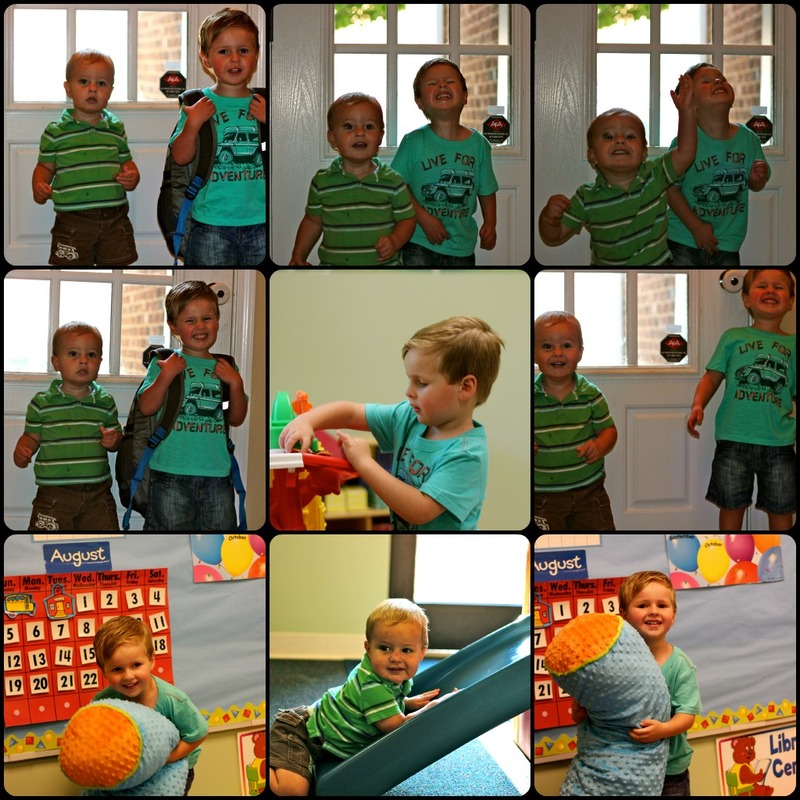 Today was Parker and Mason’s first day of school at St. Aidan’s MMO/Preschool. Parker went into the two year old class since his birthday misses the cut-off for the three year old class, and Mason went into the MMO (Mother’s Morning Out) 18-24 month program that Parker was in last year. Mason looked like someone beat him up, sporting a black eye from a fall last Friday, as well as a few bumps and bruises from, well… just being a toddler I suppose. The photos below weren’t the best either (the worst possible back lighting in the house) so it didn’t make that shiner look any nicer. When we got to school, he walked right into his classroom and started playing, but did cry when I left. When I came to pick up, she assured me that he only cried for about 10 seconds, just as I was leaving, and then he warmed up very quickly. They said he was very happy and chatty all morning. I was so worried when I left that he would be upset the whole time, but apparently, he did great! I was so happy to see him when I came to pick him up. Mason was so involved in pointing out things on a book, and had his back to me, that he didn’t even care that I arrived. He just kept showing me things in his book, chatting to me in his own language. It was so sweet, and it warmed my heart to know that he was so comfortable there and enjoyed himself! Parker did great, too. Of course, he’s used to going to school and even has the same lead teacher Ms. Amanda that he had last year! He loves her so much, and has warmed up pretty quickly to Ms. Linda, the assistant teacher as well. He can sometimes be apprehensive about having someone else take him to the potty that he doesn’t know very well, but Ms. Linda took him three times during the day, where he pee’d and pooped, so he did great! That’s my boy! He was so happy to see me when I came to pick him up and immediately got up from story time and ran to my arms to give me a big super hug. He was excited to tell me about his fun day that he had, and I was thrilled that he enjoyed himself too!